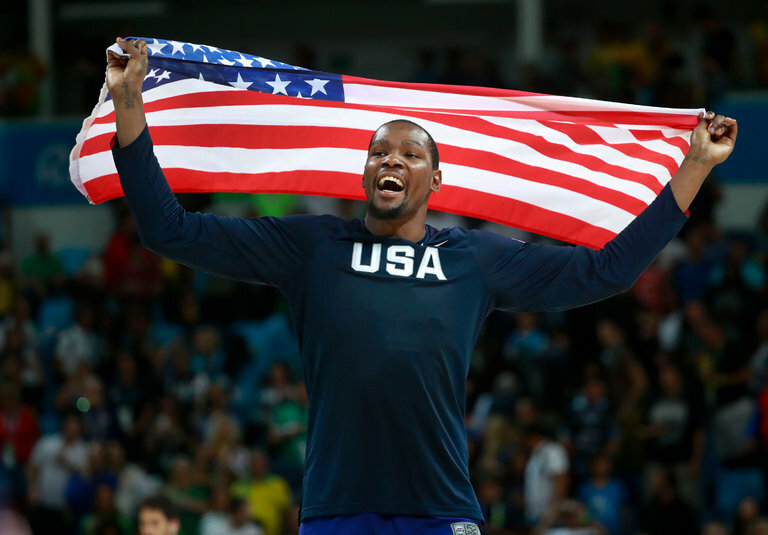 Kevin Durant scored a game-high 30 points as the United States defeated Serbia, 96-66, in the men’s basketball gold medal game. RIO DE JANEIRO — Perhaps the world is a touch further behind the United States in basketball than we realized. The American men were slow to awaken in their gold medal game against the Serbs on Sunday, just as they were slow to awaken throughout the Olympics. They opened with errant shots and missed passes, and possessions that consisted of the Americans pounding the basketball while everyone stood and watched. The Serbs, led by savvy guards and Miroslav Raduljica, a bar bouncer of a bearded and tattooed center, played like a close-knit team; the Americans played like talented strangers. The United States stumbled to a 4-point lead in the first quarter, and I awaited another not-so-impressive performance.